During Phase V, the 18 winning projects were announced and their prizes awarded. Project descriptions of the winning projects are reflected in the WSIS Stocktaking: Success Stories 2015 report, officially released at the award ceremony. Ministry of Communications and Transportation, Mexico. Telecommunications Regulatory Authority, United Arab Emirates. Ricerca sul Sistema Energetico (RSE), Italy. Ministry of Economy and Finance, Uruguay. Indian Institute of Management Bangalore, India. FHI 360, United States of America. Central Agency for Information Technology, Kuwait. Technical Centre for Agricultural and Rural Cooperation, Netherlands. Research Center for ICT Strategic and International Studies, Iran University of Science and Technology, Iran. South-West University ‘Neofit Rilski’, Bulgaria. Economic Commission for Latin America & the Caribbean. WSIS Stocktaking process provides a portal of best practices for stakeholders seeking updated information on the progress of implementation of WSIS outcomes as well as serving as a mechanism for sharing experiences on WSIS related activities. The WSIS Forum 2015 represents the world's largest annual gathering of the 'ICT for development' community. The 2015 WSIS Forum, co-organized by ITU, UNESCO, UNDP and UNCTAD, will be held from 25-29 May 2015 in Geneva Switzerland. WSIS Project Prizes is an immediate response to the requests expressed by WSIS stakeholders during the WSIS Forum 2011: to create a mechanism to evaluate and reward stakeholders for their efforts in the implementation of WSIS outcomes. The WSIS Project Prizes are an integral part of the WSIS Stocktaking Process that was set up in 2004 (Para 120, Tunis Agenda). The WSIS Project Prizes 2015 contest provides the platform to identify and showcase the success stories and models that could be easily replicated, to empower the community at the local level, to give the chance to everyone to participate in the contest and mainly to recognize the efforts of stakeholders for their added value to society and commitment towards achieving WSIS goals. The contest of WSIS Project Prizes is open to all stakeholders: governments, private sector, civil society, international organizations, academia and others. The contest comprises 18 categories that are directly linked to the WSIS Action Lines outlined in the Geneva Plan of Action. The contest of WSIS Project Prizes 2015 is organized into five phases beginning on 15 December 2014. The 18 winners of WSIS Project Prizes will be honored, recognized and presented with an award during WSIS Project Prizes 2015 Ceremony at the WSIS Forum 2015, to be held from 25 to 29 May 2015 in Geneva, Switzerland. Submit your application for the contest of WSIS Project Prizes 2015 until 25 February 2015! The United Nations Economic and Social Council (ECOSOC) resolution 2014/27 "Assessment of the progress made in the implementation of - and follow up to the outcomes of the World Summit on the Information Society", that reiterates the importance of sharing the best practices at the global level, and while recognizing excellence in the implementation of the projects and initiatives that further the goals of the WSIS, encourages all stakeholders to nominate their projects for the annual WSIS Project Prizes, as an integral part of the WSIS Stocktaking process, while noting the report on the WSIS success stories. Submission of project descriptions. Deadline for last submission: 23:00 Geneva time. The Revision of submitted projects by Expert Group that will result with a list of nominated projects. Public online voting. Deadline for casting last vote: 23:00 Geneva time. Selection of winning projects by the Expert Group that will result with a list of winning projects. Announcement of winners to the public during WSIS Project Prizes 2015 Ceremony at WSIS Forum 2015, and the release of publication "WSIS Stocktaking: Success Stories 2015", which is a compilation of extended descriptions of the 18 winning projects. The contest is open to all stakeholders, entities representing governments, private sector, international and regional institutions, civil society and academia. Each entity is allowed to submit one project per category. Stakeholders are invited to consult the rules for project submission and nomination criteria on the rules tab. During Phase II, an Expert Group revised the projects referring to the rules for project submission and nomination criteria. The outcome of the Expert Group’s work was a list of nominated projects listed below. The Expert Group consisted of professionals working on the implementation of WSIS outcomes. The decisions of the Expert Group are final and without appeal. All nominated projects will also be part of the WSIS Stocktaking Report 2015. Please see the previous edition here. Phase III provides an online mechanism for all WSIS stakeholders to participate in the contest of WSIS Project Prizes 2015. The list of nominated projects is available here. The WSIS multi-stakeholder community is invited to participate and cast its vote for one project in each of 18 categories. To begin voting, click the button below. The deadline for completing votes is 1 May 2015 (23:00 Geneva time). The first three most voted projects will be selected based on the appreciation/voting for project descriptions by WSIS stakeholders representing WSIS online network. The rules for voting should be strictly respected. During Phase V, the 18 winning projects were announced officially to the public during the Prize Ceremony, which was held at the WSIS Forum 2015 (25-29 May 2015). 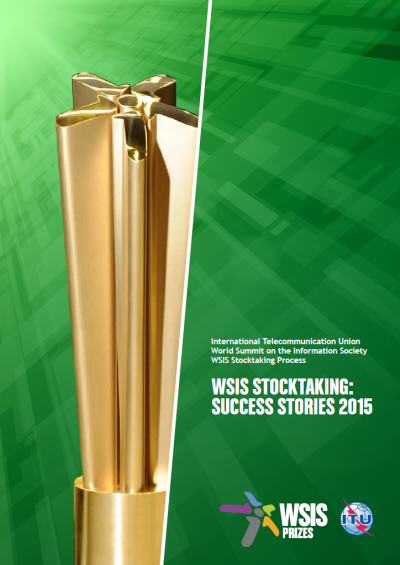 Extended descriptions of the winning projects constitute the basis for the WSIS Stocktaking: Success Stories 2015. Released at the Prize Ceremony, the success stories report showcases examples of projects on the implementation of WSIS outcomes, emphasizing achievements of stakeholders working towards achieving WSIS goals, transferring experience and knowledge at the global level and also spreading WSIS values while fostering them. The effective participation of governments and all stakeholders is vital in developing the Information Society requiring cooperation and partnerships among all of them. Development of national e-strategies, including the necessary human capacity building, should be encouraged by all countries by 2005, taking into account different national circumstances. Initiate at the national level a structured dialogue involving all relevant stakeholders, including through public/private partnerships, in devising e-strategies for the Information Society and for the exchange of best practices. In developing and implementing national e-strategies, stakeholders should take into consideration local, regional and national needs and concerns. To maximize the benefits of initiatives undertaken, these should include the concept of sustainability. The private sector should be engaged in concrete projects to develop the Information Society at local, regional and national levels. Each country is encouraged to establish at least one functioning Public/Private Partnership (PPP) or Multi-Sector Partnership (MSP), by 2005 as a showcase for future action. Identify mechanisms, at the national, regional and international levels, for the initiation and promotion of partnerships among stakeholders of the Information Society. Explore the viability of establishing multi-stakeholder portals for indigenous peoples at the national level. By 2005, relevant international organizations and financial institutions should develop their own strategies for the use of ICTs for sustainable development, including sustainable production and consumption patterns and as an effective instrument to help achieve the goals expressed in the United Nations Millennium Declaration. International organizations should publish, in their areas of competence, including on their website, reliable information submitted by relevant stakeholders on successful experiences of mainstreaming ICTs. Encourage a series of related measures, including, among other things: incubator schemes, venture capital investments (national and international), government investment funds (including micro-finance for Small, Medium-sized and Micro Enterprises (SMMEs), investment promotion strategies, software export support activities (trade counseling), support of research and development networks and software parks. Infrastructure is central in achieving the goal of digital inclusion, enabling universal, sustainable, ubiquitous and affordable access to ICTs by all, taking into account relevant solutions already in place in developing countries and countries with economies in transition, to provide sustainable connectivity and access to remote and marginalized areas at national and regional levels. Governments should take action, in the framework of national development policies, in order to support an enabling and competitive environment for the necessary investment in ICT infrastructure and for the development of new services. In the context of national e-strategies, devise appropriate universal access policies and strategies, and their means of implementation, in line with the indicative targets, and develop ICT connectivity indicators. In the context of national e-strategies, provide and improve ICT connectivity for all schools, universities, health institutions, libraries, post offices, community centres, museums and other institutions accessible to the public, in line with the indicative targets. explore other systems that can provide high-speed connectivity. In the context of national e-strategies, address the special requirements of older people, persons with disabilities, children, especially marginalized children and other disadvantaged and vulnerable groups, including by appropriate educational administrative and legislative measures to ensure their full inclusion in the Information Society. Encourage the design and production of ICT equipment and services so that everyone, has easy and affordable access to them including older people, persons with disabilities, children, especially marginalized children, and other disadvantaged and vulnerable groups, and promote the development of technologies, applications, and content suited to their needs, guided by the Universal Design Principle and further enhanced by the use of assistive technologies. In order to alleviate the challenges of illiteracy, develop affordable technologies and non-text based computer interfaces to facilitate people's access to ICT. Undertake international research and development efforts aimed at making available adequate and affordable ICT equipment for end users. Encourage the use of unused wireless capacity, including satellite, in developed countries and in particular in developing countries, to provide access in remote areas, especially in developing countries and countries with economies in transition, and to improve low-cost connectivity in developing countries. Special concern should be given to the Least Developed Countries in their efforts in establishing telecommunication infrastructure. Optimize connectivity among major information networks by encouraging the creation and development of regional ICT backbones and Internet exchange points, to reduce interconnection costs and broaden network access. Develop strategies for increasing affordable global connectivity, thereby facilitating improved access. Commercially negotiated Internet transit and interconnection costs should be oriented towards objective, transparent and non-discriminatory parameters, taking into account ongoing work on this subject. Encourage and promote joint use of traditional media and new technologies. ICTs allow people, anywhere in the world, to access information and knowledge almost instantaneously. Individuals, organizations and communities should benefit from access to knowledge and information. Develop policy guidelines for the development and promotion of public domain information as an important international instrument promoting public access to information. Governments are encouraged to provide adequate access through various communication resources, notably the Internet, to public official information. Establishing legislation on access to information and the preservation of public data, notably in the area of the new technologies, is encouraged. Promote research and development to facilitate accessibility of ICTs for all, including disadvantaged, marginalized and vulnerable groups. Governments, and other stakeholders, should establish sustainable multi-purpose community public access points, providing affordable or free-of-charge access for their citizens to the various communication resources, notably the Internet. These access points should, to the extent possible, have sufficient capacity to provide assistance to users, in libraries, educational institutions, public administrations, post offices or other public places, with special emphasis on rural and under-served areas, while respecting intellectual property rights (IPRs) and encouraging the use of information and sharing of knowledge. Encourage research and promote awareness among all stakeholders of the possibilities offered by different software models, and the means of their creation, including proprietary, open-source and free software, in order to increase competition, freedom of choice and affordability, and to enable all stakeholders to evaluate which solution best meets their requirements. Governments should actively promote the use of ICTs as a fundamental working tool by their citizens and local authorities. In this respect, the international community and other stakeholders should support capacity building for local authorities in the widespread use of ICTs as a means of improving local governance. Encourage research on the Information Society, including on innovative forms of networking, adaptation of ICT infrastructure, tools and applications that facilitate accessibility of ICTs for all, and disadvantaged groups in particular. Support the creation and development of a digital public library and archive services, adapted to the Information Society, including reviewing national library strategies and legislation, developing a global understanding of the need for "hybrid libraries", and fostering worldwide cooperation between libraries. Encourage initiatives to facilitate access, including free and affordable access to open access journals and books, and open archives for scientific information. Support research and development of the design of useful instruments for all stakeholders to foster increased awareness, assessment, and evaluation of different software models and licences, so as to ensure an optimal choice of appropriate software that will best contribute to achieving development goals within local conditions. Governments should foster a supportive, transparent, pro-competitive and predictable policy, legal and regulatory framework, which provides the appropriate incentives to investment and community development in the Information Society. prepare a report on the results of this activity to be presented for consideration and appropriate action for the second phase of WSIS in Tunis in 2005.
promote awareness of the Internet. In cooperation with the relevant stakeholders, promote regional root servers and the use of internationalized domain names in order to overcome barriers to access. Governments should continue to update their domestic consumer protection laws to respond to the new requirements of the Information Society. Promote effective participation by developing countries and countries with economies in transition in international ICT forums and create opportunities for exchange of experience. Governments need to formulate national strategies, which include e-government strategies, to make public administration more transparent, efficient and democratic. Develop a framework for the secure storage and archival of documents and other electronic records of information. Governments and stakeholders should actively promote user education and awareness about online privacy and the means of protecting privacy. Invite stakeholders to ensure that practices designed to facilitate electronic commerce also permit consumers to have a choice as to whether or not to use electronic communication. Encourage the ongoing work in the area of effective dispute settlement systems, notably alternative dispute resolution (ADR), which can promote settlement of disputes. Governments, in collaboration with stakeholders, are encouraged to formulate conducive ICT policies that foster entrepreneurship, innovation and investment, and with particular reference to the promotion of participation by women. Recognising the economic potential of ICTs for Small and Medium-Sized Enterprises (SMEs), they should be assisted in increasing their competitiveness by streamlining administrative procedures, facilitating their access to capital and enhancing their capacity to participate in ICT-related projects. Governments should act as model users and early adopters of e-commerce in accordance with their level of socio-economic development. Governments, in cooperation with other stakeholders, should raise awareness of the importance of international interoperability standards for global e-commerce. Governments, in cooperation with other stakeholders, should promote the development and use of open, interoperable, non-discriminatory and demand-driven standards. ITU, pursuant to its treaty capacity, coordinates and allocates frequencies with the goal of facilitating ubiquitous and affordable access. Additional steps should be taken in ITU and other regional organisations to ensure rational, efficient and economical use of, and equitable access to, the radio-frequency spectrum by all countries, based on relevant international agreements. Implement e-government strategies focusing on applications aimed at innovating and promoting transparency in public administrations and democratic processes, improving efficiency and strengthening relations with citizens. Develop national e-government initiatives and services, at all levels, adapted to the needs of citizens and business, to achieve a more efficient allocation of resources and public goods. Support international cooperation initiatives in the field of e-government, in order to enhance transparency, accountability and efficiency at all levels of government. Governments, international organizations and the private sector, are encouraged to promote the benefits of international trade and the use of e-business, and promote the use of e-business models in developing countries and countries with economies in transition. Through the adoption of an enabling environment, and based on widely available Internet access, governments should seek to stimulate private sector investment, foster new applications, content development and public/private partnerships. Government policies should favour assistance to, and growth of SMMEs, in the ICT industry, as well as their entry into e-business, to stimulate economic growth and job creation as an element of a strategy for poverty reduction through wealth creation. Promote collaborative efforts of governments, planners, health professionals, and other agencies along with the participation of international organizations for creating a reliable, timely, high quality and affordable health care and health information systems and for promoting continuous medical training, education, and research through the use of ICTs, while respecting and protecting citizens' right to privacy. Facilitate access to the world's medical knowledge and locally-relevant content resources for strengthening public health research and prevention programmes and promoting women's and men's health, such as content on sexual and reproductive health and sexually transmitted infections, and for diseases that attract full attention of the world including HIV/AIDS, malaria and tuberculosis. Alert, monitor and control the spread of communicable diseases, through the improvement of common information systems. Promote the development of international standards for the exchange of health data, taking due account of privacy concerns. Encourage the adoption of ICTs to improve and extend health care and health information systems to remote and underserved areas and vulnerable populations, recognising women's roles as health providers in their families and communities. Strengthen and expand ICT-based initiatives for providing medical and humanitarian assistance in disasters and emergencies. Encourage the development of best practices for e-workers and e-employers built, at the national level, on principles of fairness and gender equality, respecting all relevant international norms. Promote new ways of organizing work and business with the aim of raising productivity, growth and well-being through investment in ICTs and human resources. Promote teleworking to allow citizens, particularly in the developing countries, LDCs, and small economies, to live in their societies and work anywhere, and to increase employment opportunities for women, and for those with disabilities. In promoting teleworking, special attention should be given to strategies promoting job creation and the retention of the skilled working force. Promote early intervention programmes in science and technology that should target young girls to increase the number of women in ICT carriers. Governments, in cooperation with other stakeholders are encouraged to use and promote ICTs as an instrument for environmental protection and the sustainable use of natural resources. Government, civil society and the private sector are encouraged to initiate actions and implement projects and programmes for sustainable production and consumption and the environmentally safe disposal and recycling of discarded hardware and components used in ICTs. Establish monitoring systems, using ICTs, to forecast and monitor the impact of natural and man-made disasters, particularly in developing countries, LDCs and small economies. Ensure the systematic dissemination of information using ICTs on agriculture, animal husbandry, fisheries, forestry and food, in order to provide ready access to comprehensive, up-to-date and detailed knowledge and information, particularly in rural areas. Public-private partnerships should seek to maximize the use of ICTs as an instrument to improve production (quantity and quality). Promote affordable and reliable high-speed Internet connection for all universities and research institutions to support their critical role in information and knowledge production, education and training, and to support the establishment of partnerships, cooperation and networking between these institutions. Promote electronic publishing, differential pricing and open access initiatives to make scientific information affordable and accessible in all countries on an equitable basis. Promote the use of peer-to-peer technology to share scientific knowledge and pre-prints and reprints written by scientific authors who have waived their right to payment. Promote the long-term systematic and efficient collection, dissemination and preservation of essential scientific digital data, for example, population and meteorological data in all countries. Promote principles and metadata standards to facilitate cooperation and effective use of collected scientific information and data as appropriate to conduct scientific research. Cultural and linguistic diversity, while stimulating respect for cultural identity, traditions and religions, is essential to the development of an Information Society based on the dialogue among cultures and regional and international cooperation. It is an important factor for sustainable development. Create policies that support the respect, preservation, promotion and enhancement of cultural and linguistic diversity and cultural heritage within the Information Society, as reflected in relevant agreed United Nations documents, including UNESCO's Universal Declaration on Cultural Diversity. This includes encouraging governments to design cultural policies to promote the production of cultural, educational and scientific content and the development of local cultural industries suited to the linguistic and cultural context of the users. Develop national policies and laws to ensure that libraries, archives, museums and other cultural institutions can play their full role of content - including traditional knowledge - providers in the Information Society, more particularly by providing continued access to recorded information. Support efforts to develop and use ICTs for the preservation of natural and, cultural heritage, keeping it accessible as a living part of today's culture. This includes developing systems for ensuring continued access to archived digital information and multimedia content in digital repositories, and support archives, cultural collections and libraries as the memory of humankind. Develop and implement policies that preserve, affirm, respect and promote diversity of cultural expression and indigenous knowledge and traditions through the creation of varied information content and the use of different methods, including the digitization of the educational, scientific and cultural heritage. Support local content development, translation and adaptation, digital archives, and diverse forms of digital and traditional media by local authorities. These activities can also strengthen local and indigenous communities. Provide content that is relevant to the cultures and languages of individuals in the Information Society, through access to traditional and digital media services. Through public/private partnerships, foster the creation of varied local and national content, including that available in the language of users, and give recognition and support to ICT-based work in all artistic fields. Strengthen programmes focused on gender-sensitive curricula in formal and non-formal education for all and enhancing communication and media literacy for women with a view to building the capacity of girls and women to understand and to develop ICT content. Nurture the local capacity for the creation and distribution of software in local languages, as well as content that is relevant to different segments of population, including non-literate, persons with disabilities, disadvantaged and vulnerable groups especially in developing countries and countries with economies in transition. Give support to media based in local communities and support projects combining the use of traditional media and new technologies for their role in facilitating the use of local languages, for documenting and preserving local heritage, including landscape and biological diversity, and as a means to reach rural and isolated and nomadic communities. Enhance the capacity of indigenous peoples to develop content in their own languages. Cooperate with indigenous peoples and traditional communities to enable them to more effectively use and benefit from the use of their traditional knowledge in the Information Society. Exchange knowledge, experiences and best practices on policies and tools designed to promote cultural and linguistic diversity at regional and sub-regional levels. This can be achieved by establishing regional, and sub-regional working groups on specific issues of this Plan of Action to foster integration efforts. Assess at the regional level the contribution of ICT to cultural exchange and interaction, and based on the outcome of this assessment, design relevant programmes. Governments, through public/private partnerships, should promote technologies and R&D programmes in such areas as translation, iconographies, voice-assisted services and the development of necessary hardware and a variety of software models, including proprietary, open source software and free software, such as standard character sets, language codes, electronic dictionaries, terminology and thesauri, multilingual search engines, machine translation tools, internationalized domain names, content referencing as well as general and application software. The media — in their various forms and with a diversity of ownership — as an actor, have an essential role in the development of the Information Society and are recognized as an important contributor to freedom of expression and plurality of information. Encourage the media - print and broadcast as well as new media - to continue to play an important role in the Information Society. Encourage the development of domestic legislation that guarantees the independence and plurality of the media. Take appropriate measures - consistent with freedom of expression - to combat illegal and harmful content in media content. Encourage media professionals in developed countries to establish partnerships and networks with the media in developing ones, especially in the field of training. Promote balanced and diverse portrayals of women and men by the media. Reduce international imbalances affecting the media, particularly as regards infrastructure, technical resources and the development of human skills, taking full advantage of ICT tools in this regard. Encourage traditional media to bridge the knowledge divide and to facilitate the flow of cultural content, particularly in rural areas. International cooperation among all stakeholders is vital in implementation of this plan of action and needs to be strengthened with a view to promoting universal access and bridging the digital divide, inter alia, by provision of means of implementation. Within the context of the UN's Global Compact and building upon the United Nations Millennium Declaration, build on and accelerate public-private partnerships, focusing on the use of ICT in development. *WSIS Action Line C7 is separated into 8 individual categories in-line with the ICT applications sectors. All details requested in the questionnaire should be completed strictly respecting the type of stakeholder and the structure of the submission template. The incomplete submissions will not be accepted. Minimum number of words requested should be respected (executive summary 100 words and project information 1500-2000 words/ Word Format). Winning projects of previous WSIS Project Prizes contests are not eligible to participate in the contest. The submission should be complied with rules for project submission. The requested information in the template should respond to all questions and provide detailed information on the goals, timeframe, project’s added value and importance, results and challenges. Minimum number of words requested should be respected (executive summary 100 words and project information 1500-2000 words). The first three most voted projects are selected based on the appreciation/voting of projects by WSIS stakeholders representing WSIS online network. The stakeholders are invited to appreciate/vote for projects in all 18 categories.